Kifco has more than 40 years of experience in the design and manufacture of traveling irrigation machines. The highly efficient turbine motor was developed specifically for the hard hose traveler to operate with both fresh and ‘gray’ water. These machines are marketed under Kifco’s trademark Ag-Rain. Ag-Rain Engine Drive machines are available for applications where the water quality does not permit the use of a turbine. Kifco Water-Reels® are designed to make portable irrigation easy. The machines are simple to operate and provide efficient irrigation over a wide variety of applications. 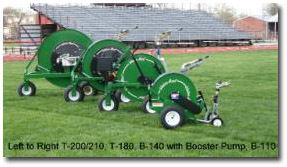 Water-Reels® are compact, highly mobile and offer many benefits. They are ideal for irrigation areas up to 35 acres. When natural rainfall fails to provide adequate water, irrigation will prove to be beneficial. No irrigation method beats hard hose travelers for versatility and the ability to irrigate quickly with a minimum amount of labor. The mobility and range has earned the hard hose traveler a place on agricultural fields, pastures, athletic turf, sod farms, nurseries, cemeteries, arenas, compost facilities, and for dust suppression. 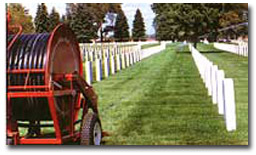 Landscaping, Cemeteries and Parks maintain their beauty and preserve the value of the landscaping. Vegetable Crops and Fruit will maintain constant growth, resulting in increased yields. Irrigated crops can be earlier into the marketplace and take advantage of higher prices.